Throw out the idea of a vegan cookbook club to your friends-- either on social media or in person. Once you have even four friends excited and willing to come to the first meeting, you've got a platform. Invite people to join the club. To keep it intimate, create a private Facebook group. Add friends who said they're interested in the club. Ask those excited friends to add their friends. (It's polite to get a friend's permission before adding them to the FB group.) If your crowd is not on Facebook, use Google Groups to connect members over email instead. Don't just invite vegans and vegetarians. Invite folks who are veg-curious, interested in cooking, wanna get healthy, or just love to socialize. Our group includes people with all kinds of dietary preferences. To open the group to complete strangers (instead of just friends and friends-of-friends), create a public Facebook group or a Meetup group. For your safetly, do not do this if meetings are going to be held in member's homes! Contact a local library, church, gallery, or community center to see if they'd be willing to let you use their space for meetings. Use Canva to make printable flyers and web images to promote the group, then post them around town (library, post office, cafe, church, laundromat, supermarket, yoga studio, etc) and online. As the organizer of the group, you should be prepared and open to the idea of hosting the first meeting, either at your home or in a public venue. You could be super democratic and try to choose a book, time, and place that suits all or a majority of members. Facebook lets you post polls on your group page, so that'd be a good way to manage those tasks. Outside of Facebook, you can poll members using Doodle to schedule a time. We have conversations on the group page about cookbooks we're excited about, which makes it easier for the host to choose. We also try to only choose books that are available at the public library for those of us who want to save money and shelf space (and only invest in books once we know we can't live without them, which is something that this book club helps you figure out). Books our club has focused on include: The Oh She Glows Cookbook, Chloe's Vegan Italian Kitchen, and Vegan World Fusion Cuisine. Instead of a cookbook, you can also choose a theme. The theme of our first meeting was simple: Favorite Vegan Cookbook. Everyone brought their go-to vegan cookbook and a dish prepared from a recipe in the book. In October, the meeting theme was Fall Favorites. Themes are a good way to be exposed to a wider variety of cookbooks. Another twist is to choose a vegan blog to cook recipes from. When we hosted the Oh She Glows potluck, people made recipes from the book, the blog, and the app. Once you've got all that sorted out, create a Facebook event for your group or send the details out to your email group. If you're using FB, it helps to tag members in a post on the event page, so that they don't miss it. Host puts out beverages, dining ware, napkins, etc. (A buffet server, warming tray, and/or crock-pot, are useful for keeping food warm so definitely put that stuff out if you have it.) The host also makes a copy of the featured cookbook available for guests to refer to during the meeting. Creating dining room for a large group can be a challenge in a small space, but it's totally possible. Check out these 15 tips for hosting a dinner party in a small apartment. Guests set up their dishes together in the kitchen when they arrive. Once everyone is there, people introduce themselves and say what they brought. Everyone makes a plate. People sit together to eat, talk about the book, talk about cooking, and get to know each other better. It's really fun! During or right after a meeting is the best time to pick a book and inspire someone to host the next meeting. Aim to have at least one meeting each month, but don't be too rigid. Pick a frequency that works for your group to maximize fun and minimize burnout. 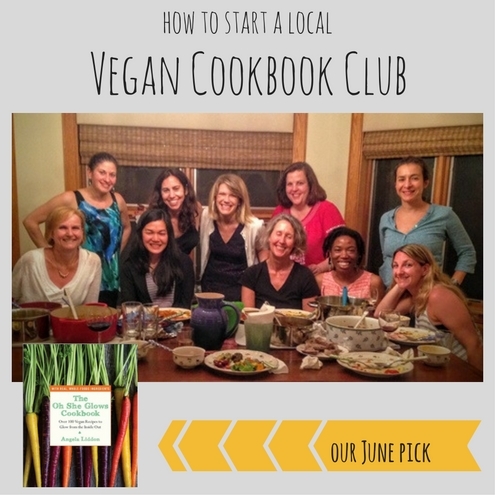 Would you participate in a vegan cookbook club or another kind of cookbook club? Do you already do something like this in your neighborhood?